The boys head back to school tomorrow as their Chinese New Year holiday comes to an end… I can’t wait. This is one of my favorite times to be in Beijing but I get absolutely nothing productive done. Partying aside, the thing I love best about this holiday is the lack of traffic. Because so many people leave the city and those who stay don’t have to go to work, there are almost no cars on the road. For John’s 50th birthday, our friend Philippe and his, so beautiful its hard not hate her, wife, V, gave him a couple of nights at the Opposite House Hotel. We decided to use one of these on Wednesday night. Normally we would expect this drive to take 45 minutes to an hour (but has taken as much as 2 hours on a bad day)… we were at the door of the hotel 20 minutes after leaving our house! 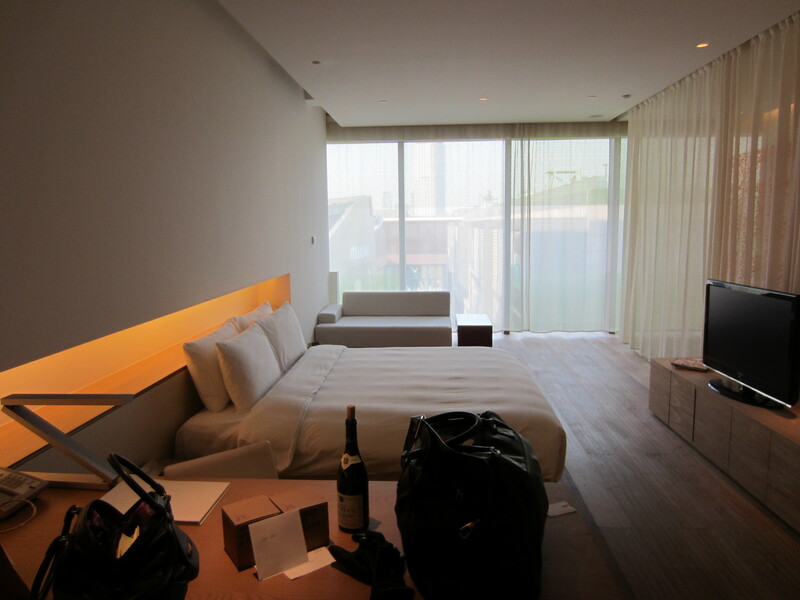 The hotel is gorgeous. The building was designed by the Japanese architect, Kengo Kuma, and finished in 2008. I knew the lobby and the bar quite well as we have used them as meeting points since we moved to Beijing. The ground floor is called The Art House and is used as a gallery for large contemporary art installations. There is no check in desk, instead a guy dressed casually in jeans and a black shirt asks if he can help you with anything and leads you a computer terminal. Philippe is the founder of the Kiwi Collection, a specialty hotel service and he really knows his hotels. We get his advice and book through them regularly. One of the things Kiwi prides itself on is getting clients upgrades. It worked this time, and we were given a bigger room than we had reserved. An added treat was the delivery of the most delicious cupcakes! Divine with the bottle of wine we had brought from home! After a much needed romantic night away, the boys came downtown to meet us for a dumpling lunch. Dumplings are thought to look like little silver ingots and are a traditional dish to eat at New Year. Legend has it, the more you eat, and the more prosperous your year will be. We devoured a lot…should be a very good year!! 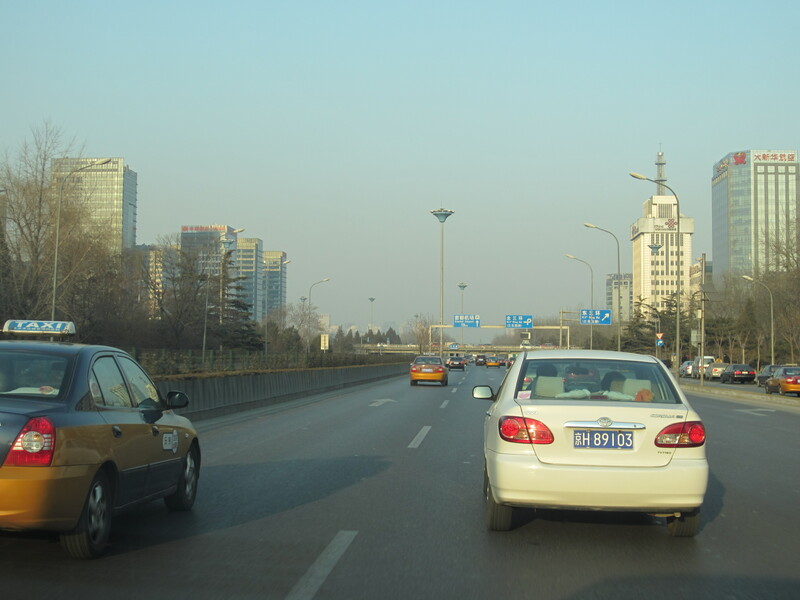 We then decided to take advantage of the clear roads and visit the Hou Hai. 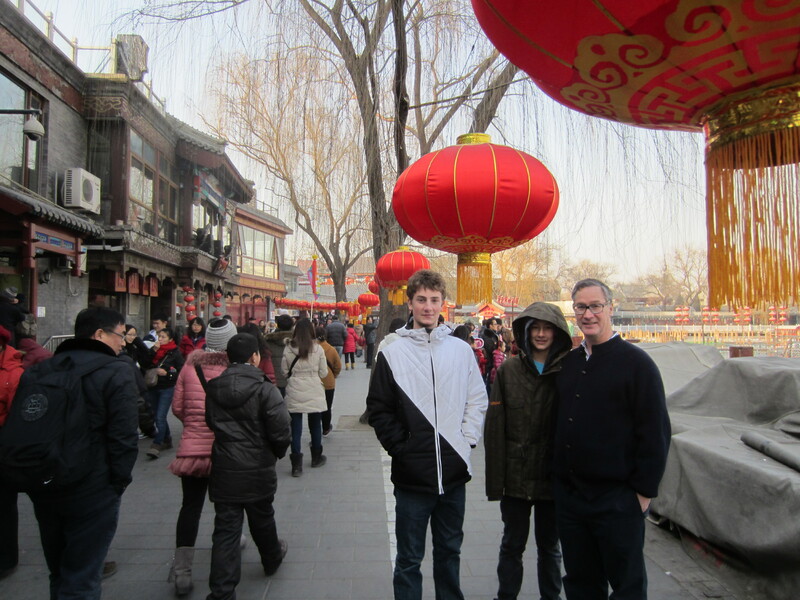 Hou Hai is the name of a lake in central Beijing surrounded by tons of little shops, bars and restaurants. It is a very popular place for the Chinese to hang out, particularly in the summer to escape the heat. Expecting to explore a deserted neighborhood, we were shocked to discover it also a very popular place during the freezing cold winter. 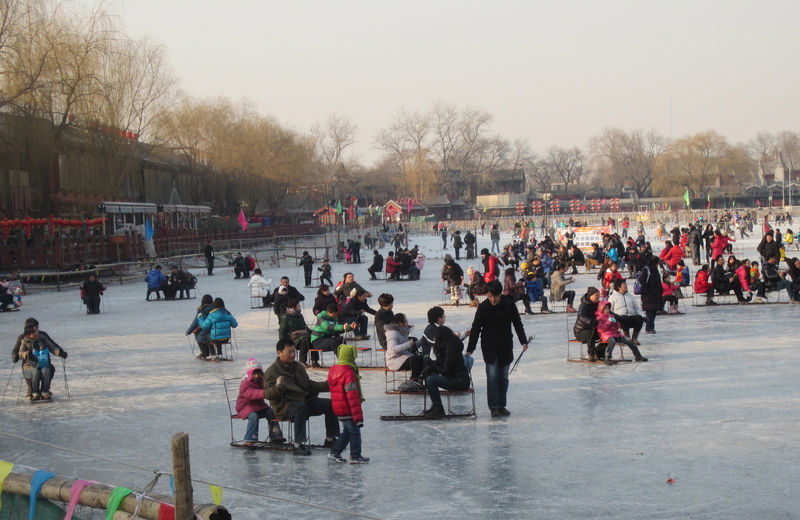 Thousands of people were on the frozen lake… performing an amusing variation of skating. People sit on chairs with runners and push themselves along with sharp sticks. As Canadians we felt terribly superior. I told the boys stories of skating on deserted lakes when I was kid! New Year’s is really only one day; the proper name of this holiday is Spring Festival. It doesn’t end until the full moon on February 7th. By then the fireworks will have died down, people will for the most part have returned to the city and we will spend too much of the night fighting traffic as we join the crowds in celebrating the lantern festival. Luckily, being tall and fair, we tend to stand out so hopefully won’t loose each other. Last year the crowd was in the millions! I love reading your blog, despite the fact that it makes my own life boring, pedantic and provincial by comparison. I guess that’s what’s called vicarious enjoyment.